Tess Brown reports from UCL’s Institute of Cognitive Neuroscience 20th Anniversary Conference, 'Mind the brain'. A sold out crowd of over 300 attendees, made up of academics, students, and the general public, made their way into Jeffrey Hall at the University College London’s Institute of Education to be a part of 'Mind The Brain'. This conference aimed to celebrate 20 years of groundbreaking research at the Institute of Cognitive Neuroscience (ICN), but also to bring the future of cognitive neuroscience to the public by featuring short, 15-minute engaging and accessible talks by all 12 speakers and four panelists. Host of the conference, Steve Cross, kicked off the day with lighthearted humour, which relieved the nerves the speakers while exciting the packed crowed for the first block of talks. Cross welcomed on the first speaker to deliver the keynote address, Tim Shallice. Shallice, the founder of the Institute of Cognitive Neuroscience, spoke on the vast history of the ICN, from its foundation in 1996 to its current research. His talk humbled attendees by allowing them to have perspective on how far the field of cognitive neuroscience has come in the past 20 years, and how much of an integral role the ICN has had in that development, and will continue to have into the future. 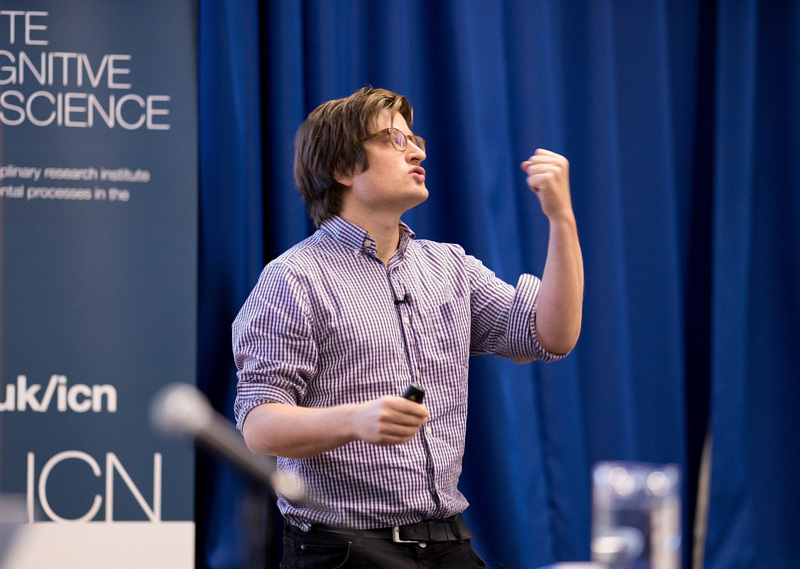 Block 1 continued with talks from prominent researchers at the ICN, Leun Otten, Oliver Robinson [pictured above, photo by Steve Cross] and Lucy Foulkes. All three are highly focused on how their research can impact the future of cognitive neuroscience. For example, Leun Otten spoke on the importance of brain states when forming new memories. She used her research to suggest a future in optimising learning and education, whereby teachers could utilise brain state detectors, such as a portable EEG like EMOTIV, to analyse when students are at their most optimal brain states. Then, teaching can take place in order to maximise efficiency. Otten dazzled the audience by featuring a demonstration of how the EMOTIV technology works, and just how easy it is to be implemented in an everyday learning environment. Robinson and Foulkes wrapped up the first block of speakers by discussing the importance of understanding the underlying causes of psychiatric disorders instead of simply treating symptoms. Robinson focused on anxiety, while Foulkes focused on disorders of social reward, specifically, psychopathy. The second block of speakers widened the scope, by extending beyond research done at the ICN. Cognitive neuroscience research is prominent all over UCL’s campus. In block 2, Robb Rutledge spoke about his work on happiness. Rutledge said, “happiness does not depend on what you have in your life, rather, you are happy when things are going better than you expected.” To illustrate, silver medalists tend to feel less happy than bronze medalists, because the silvers were so close to winner, whereas the third place winners are just happy to be on the podium! Therefore, Rutledge concluded, happiness and reward are not one in the same. Additional speakers in the second block included Valerie Curran, who discussed on the medicinal uses for cannabis, Camilla Nord and Sarah White. Nord explained the anomaly of antidepressants. Her answer to explain why antidepressants take at least 4-8 weeks to change mood is rooted in the idea that antidepressants change negative biases first, as a bottom up approach. After many negative biases are changed, improvements in mood follow. On the other hand, White gave the audience an insight into autism, and how a novel, augmented reality, pretend play game can work as a treatment for Autistic Spectrum Disorder children. The third and final block of individual speakers started out with Katerina Fotopolou who spoke on the social aspects of subjective experience. For example, when a child falls in the park, that child often tends to look around for its parent before it starts to cry. Why is this? Fotopolou explained that having social confirmation of pain gives this child the ‘green light’ to start crying. In a way, Fotopolou said, this is because there is an innate biological need for social interaction. This research sheds light on the difference between subjectivity and individuality of experience, whereas pain is often thought of individualistic, however, this talk provided evidence as to why it is indeed a social experience. Steve Di Costa, Jo Hale and Bahador Bahrami followed with talks on how sensory cues give a sense of agency, how avatars can help form the future of social mimicry, and the neuroscience of persuading others, respectively. To conclude the day of talks, a panel discussion featuring Martin Eimer, Nima Khalighinejad, Anna Kuppuswamy and Geraint Rees looked to answer questions on the future of cognitive neuroscience both from the audience and from the live twitter feed. The questions led to an enlightening conversation, not just with the panelists amongst themselves, but with the audience and twittersphere as well. All audience members were engaged in a dialogue on topics ranging from neurobunk, ethics, happiness, and Brexit. The unique perspectives of the panelists allowed the audience to gain a holistic understanding of the future of neuroscience. At the beginning of the panel discussion, each panelist gave a five-minute synopsis of his or her thoughts on the future of cognitive neuroscience. Martin Eimer started by saying, “one thing that has changed is the way we talk about our mind, mental states and brain states.” He observed that there is now an effortless and natural talk about brain states and functions when interpreting mental states. The way neuroscience has infiltrated every day language and thought has impacted the fields of economics, law and theology, showing how the brain has become a mainstay in how we think about ourselves. Next, Nima Khalighinejad suggested that the future of cognitive neuroscience depends on a shift from encoding to decoding. In the years to come, Khalighinejad believes the field of cognitive neuroscience will help us gain a richer understanding of who we are as humans. Lastly, Geraint Rees took the podium to discuss the future of cognitive neuroscience. Rees believes the following three points to be true, “First, the future is not about me, it is about you. Second, the future is a lot more like the past than you think. And third, cognitive neuroscience is about understanding what people do, in reference to the brain.” By saying this, Rees made the future of cognitive neuroscience a field that is no longer controlled by a small, academic elite, but one that everyone is responsible for. - Tess Brown is a Cognitive Neuroscience Candidate at University College London.